Sasaki Time: Discovery Cube LA Media Preview: Discovery Cube OC Brings Their Magic to Los Angeles! Discovery Cube LA Media Preview: Discovery Cube OC Brings Their Magic to Los Angeles! 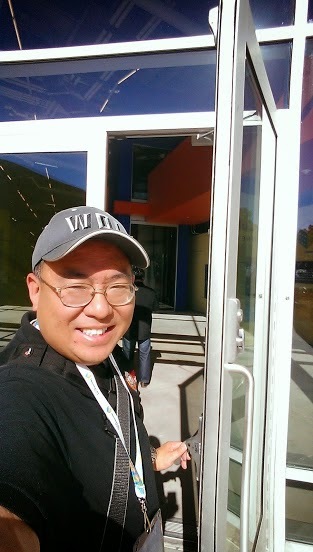 Sasaki Time was invited to a special Media Preview Day at the brand new Discovery Cube Los Angeles! Discovery Cube Orange County is already one of my favorite places to visit and I could not wait to check out the new facility! Love the large welcome sign! Time to take my first step into Discovery Cube LA! Let's take a look around! I saw this display and had to go check it out myself! You actually get to pedal the bike and see the skeleton pedal his bike as well! What a cool way to show how skeletal structure works! Right next to this is a wind tunnel to show how powerful the Santa Ana winds can get. One of my favorite things from Discovery Cube OC has found it's way up here! You take a shopping cart that has a tablet on it. There are various games to play to teach kids on how to be healthy and environmentally friendly. It's also a great way for adults to learn as well! You don't need kids to have a good time here! You just have to have a love for learning! 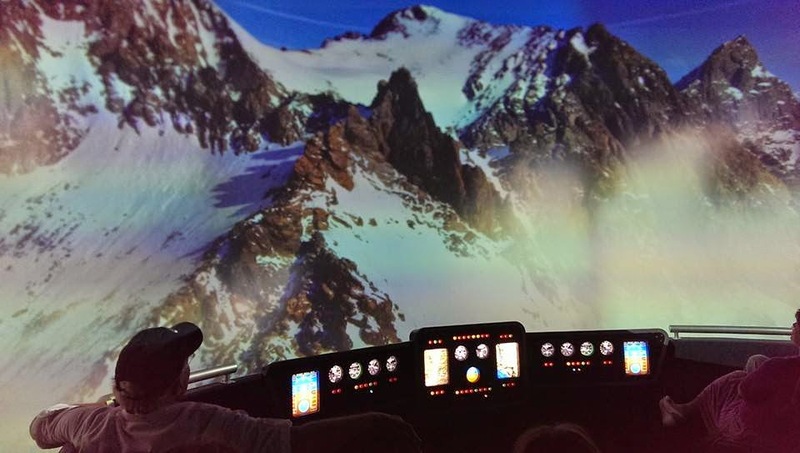 A really cool exhibit unique to Discovery Cube LA is this helicopter tour. With a large screen you will be able to take one of two tours. One will take you through the sewer system and how water is treated, The other takes you through the California aqueduct system from beginning to end. A new favorite that I am sure will be very popular! This is a photo from one of the helicopter tours. This is from the California aqueduct tour. Right across from the helicopter tour is the Aquavator. This reminded me of one of my favorite features of original Living Seas attraction at EPCOT where you boarded the hydrolator on your way to SeaBase Alpha. But instead of traveling deep into the ocean, you travel down through the layers of earth to see and learn about the water table. The coolest exhibit starts here at this truck. You check out a tablet to try to become a home inspector. You will learn how to make better sustainability, resource and efficiency choices for your home. Take a look at this home. I want to live here! There are different games to play to earn badges. Each game will take you all over the house. This was really fun and engaging. My friend Drew and I learned a lot and both commented many times on how cool it would be if Innoventions at Disneyland had something like this. Drew became an Inspector! Great job Drew! There is a Bean Sprouts location inside. They have several locations in California. They are all at other children-type museums. The idea is to bring fun and healthy food to kids. They even cater to special dietary choices and challenges. Bean Sprouts had a sample one of their more popular items, the Do-Re-For-Me sandwich made with sunflower butter and organic jam. I never would have guessed that it wasn't peanut butter. It was was so good and I hope to try more of their food soon! The Planetary Research Station is another favorite from the OC. Inside you will find a suspended Earth to look at weather patterns as well as historic storms as they happened. You will see earthquakes and their impact on our planet. You will also see flight patterns at night. There is a cool Dinosaur area where kids can learn more about my favorite creatures that ever existed. Never upset a dinosaur. If you do make sure you can outrun him! 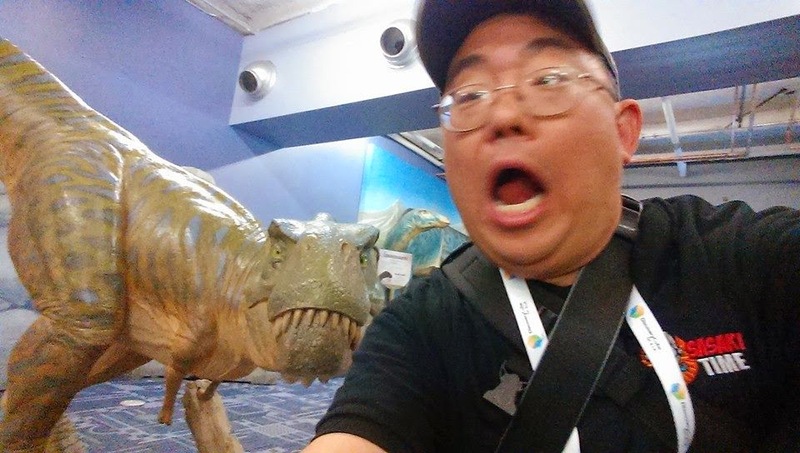 On a serious note, it's so cool to see various dinosaur models like the one behind me. I just wanted to have some fun with this photo. Upstairs there are several smaller displays and hands on activities but the Science of Hockey is one I am most looking forward to! There is one at the OC but this one looks like it will be much larger! The Discovery Cube OC has a partnership with the Ducks and of course Discovery Cube LA would have one with the Kings! That is a quick look at the brand new Discovery Cube Los Angeles! The Discovery Cube LA opens on November 13th, 2014!